Few know that Lampedusa has its own small scale version of a megalithic temple such as those that can be found in the nearby Malta island. 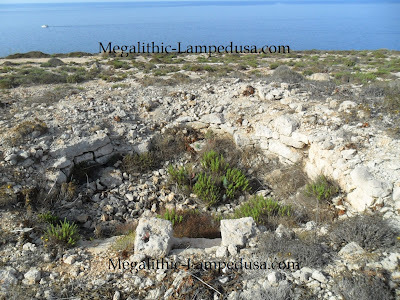 The megalithic temple of Lampedusa (this definition has yet to be confirmed by official research) reminds us of the smallest and oldest temple of the Mnajdra complex in Malta (temple A) and of the Skorba temple. 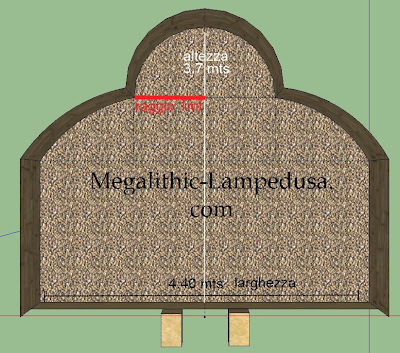 Below we will try to describe the small temple of Lampedusa: its location, shape, orientation, building materials and construction. 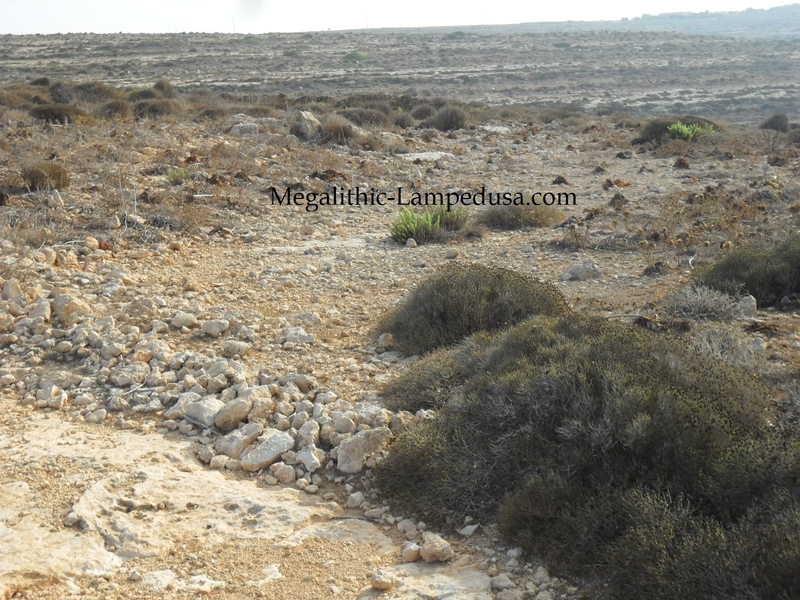 The small megalithic temple of Lampedusa is located inside the zone A of the Natural Reserve of Lampedusa. Its geographic cohordinates are: 35°:30’:35,55’’ N Latitude and 12°:34’:15.16’’E Longitude (see satellite map below). The site of the small megalithic temple of Lampedusa contains traces of megalithic buildings on a area of 100x 90 meters at an altitude of approximately 50 meters on the sea level on the coast that declines from the Tabaccara Coast to the sea in the SE direction. 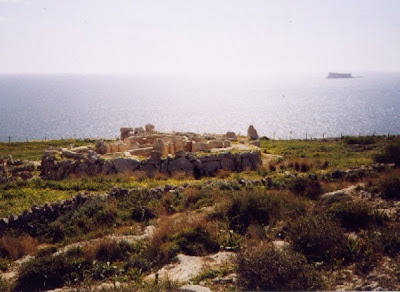 It is an ideal location for sky watching and observation of the dawn and sunset on all the arc between the Winter and Summer solstice. 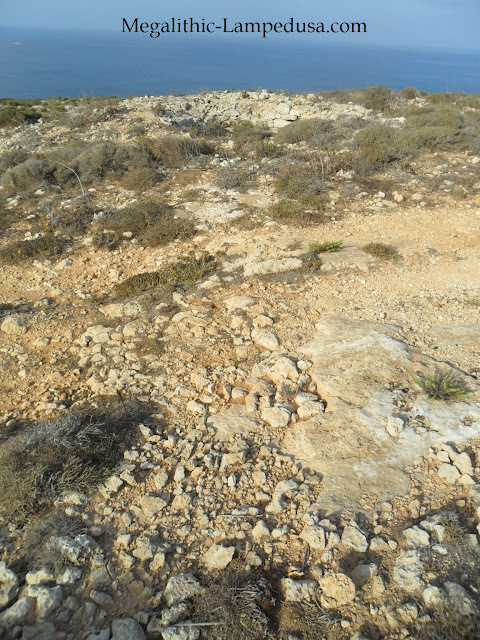 Moreover the site is located along the SW-NE axis of the island almost at its "geographic" center. 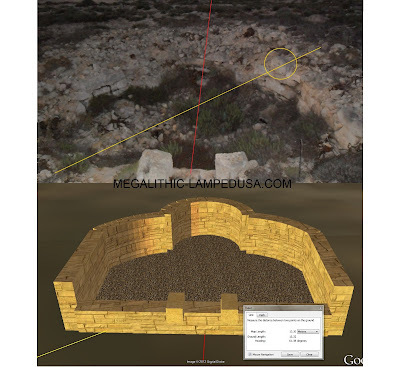 Below we proceed with the description of the site numbering its observable remains and defining them according to their most likely function (although no scientific confirmation has already been offered for such scheme). 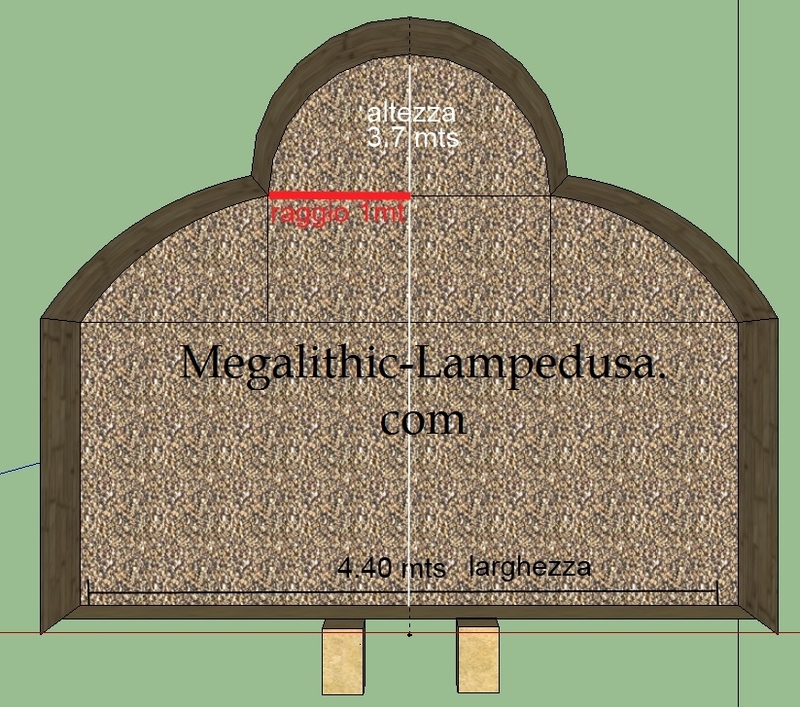 A small simple structure with a clover leaf shape: max width 4.40 mt, max length 3.70 mt, max wall height (0,90 mt). The floor of the temple lays below the surrounding terrain (approximately 1 meter) a position relative to the ground similar to that of the Skorba Temple in Malta. There is no trace left of a cover or ceiling. Prof. Diceglie4 (unique researcher who visited the site in the eighties) proposed a funerary/tomb function for this structure; here we prefer to describe it as a small megalithic temple on the basis of its resemblance to the Maltese temples. 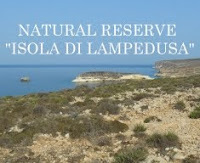 It should not be forgotten that Malta is only 80 Miles NW of Lampedusa. The entrance of the small megalithic temple of Lampedusa is orientated on a axis laying at 190° toward SW, its walls are built excursively in limestone rocks vaguely squared. 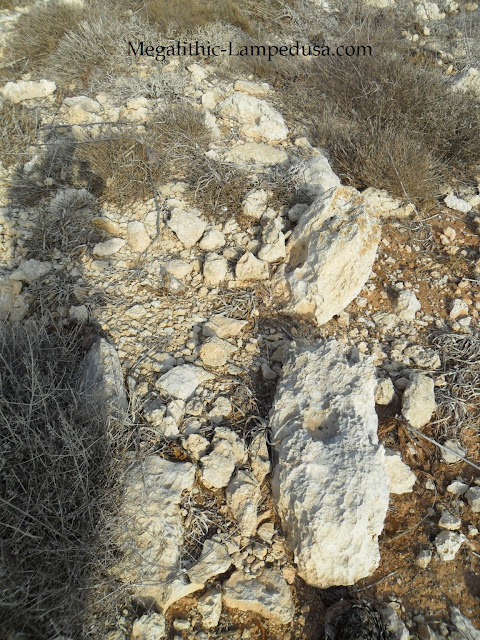 A stone alleyway leads to the temple entrance on the NS axis. This alleyway is still clearly visible despite being exposed to the erosion and being crossed longitudinally by a modern walking road. 3-Stone remains East sector From the temple looking eastward there are remains of ancient buildings' foundations, there small pottery sherds can be found on the surface. Excavations may reveal other interesting remains. 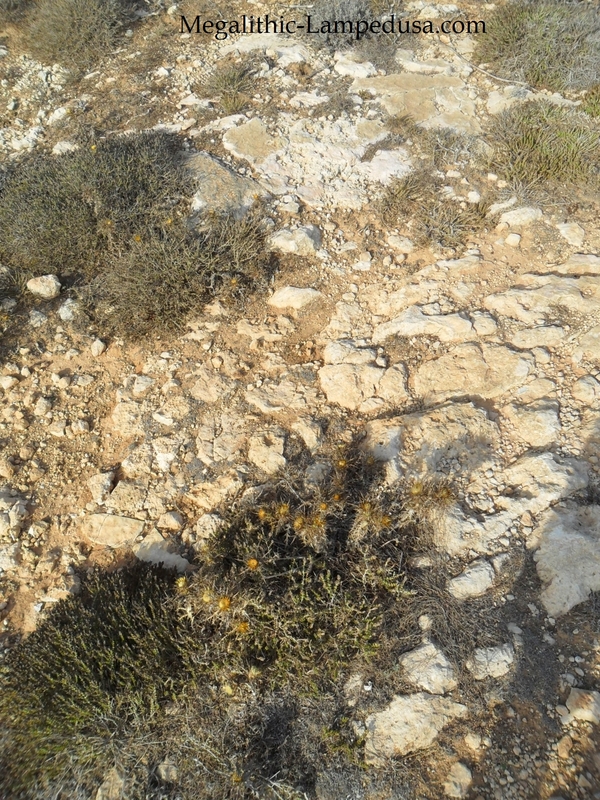 From the temple looking eastward there are remains of ancient buildings' foundations, there small pottery sherds can be found on the surface. 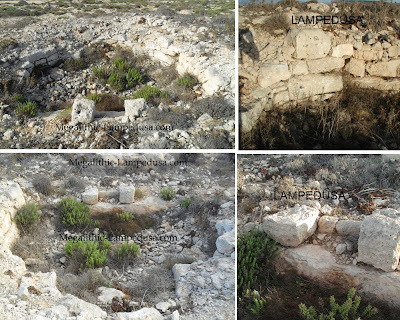 Excavations may reveal other interesting remains. 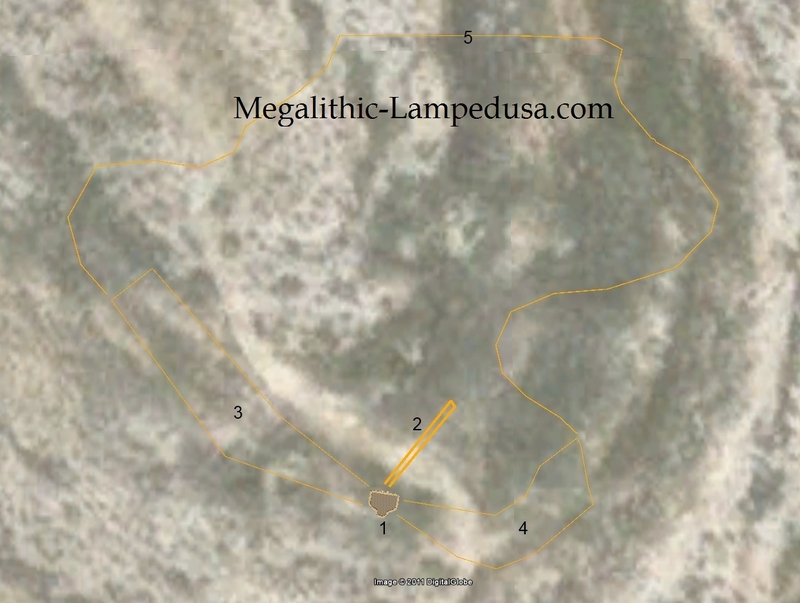 In the area surrounding the small temple remains of megalithic walls can be observed. 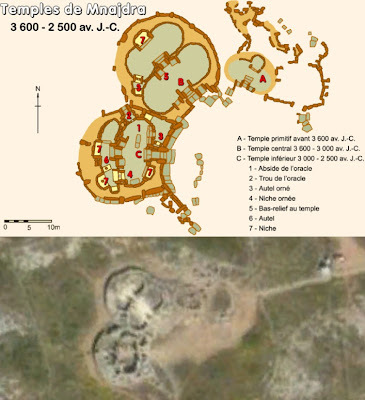 The Mnajdra temples complex of Malta (3600-3200 BC - Ggantija phase) is composed by three main buildings, the smallest and probably the oldest one (often cited as temple A) has some remarkable similarities to the small temple of Lampedusa: simple clover leaf shape, same building blocks, same orientation (190° Lampedusa 200° Mnajdra temple A) same proportions. 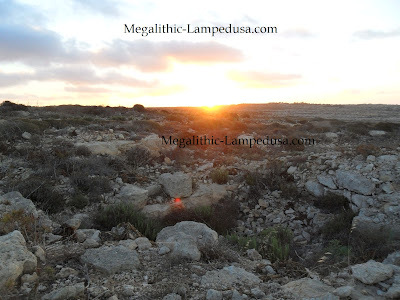 The small megalithic temple of Lampedusa has a main axis with a particular 190° orientation and it is located the most favorable position for observing rising and setting sun in Lampedusa. A test carried out on the exact date of the Summer Solstice of year 2011 revealed an interesting feature of the small temple: from the entrance of the temple looking South West with the Sun rising North East on the back of the observer, the sunlight hits a rock which is bigger and taller than the others composing the temple structure. It may be suggested that such rock could be a marker indicating the summer solstice date (see sequence below). 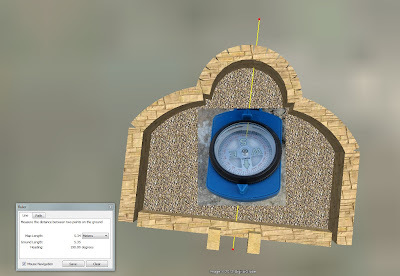 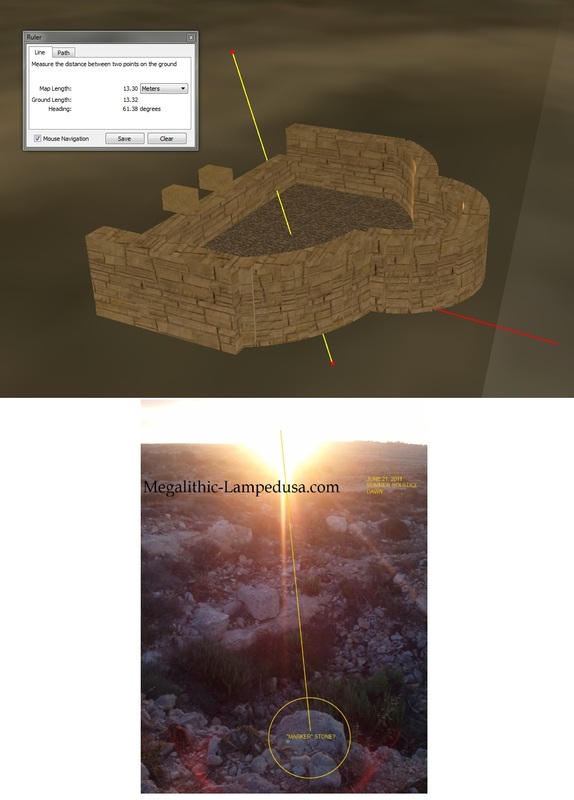 Original view (summer solstice 2011) and computer simulation of the Summer Solstice from the temple entrance. 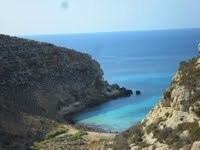 Original view (summer solstice 2011) from the "marker" rock. 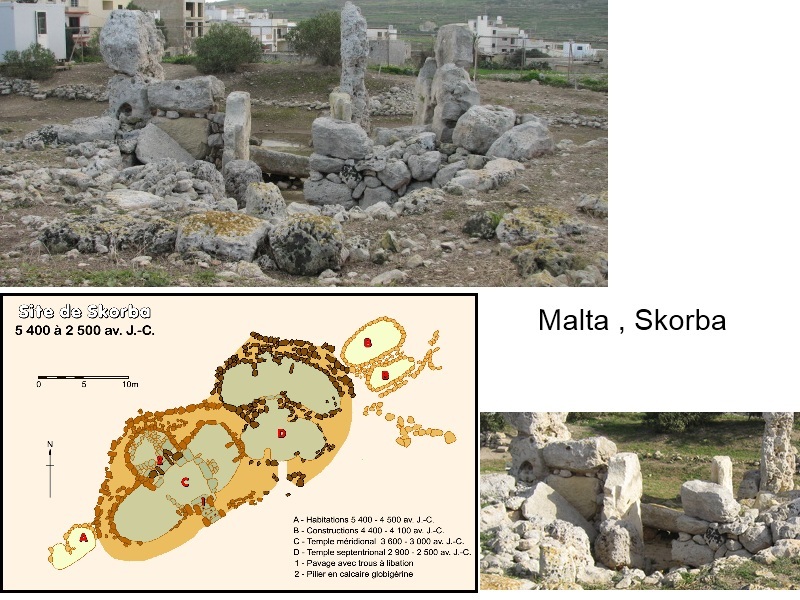 Usually a discussion of the contents would follow such a descriptive article, unfortunately we can rely only on photographic documentation because, as of writing, no official research has ever been completed or started about this interesting stone structure. 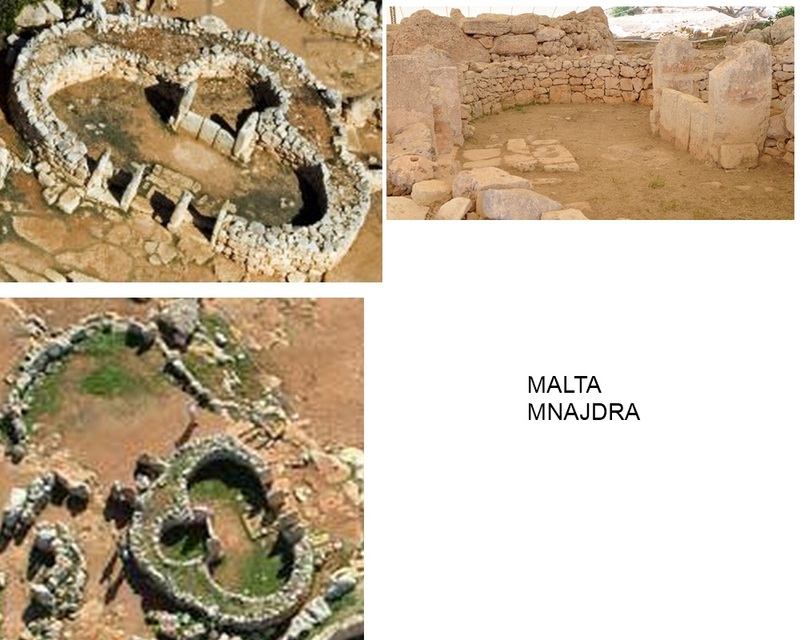 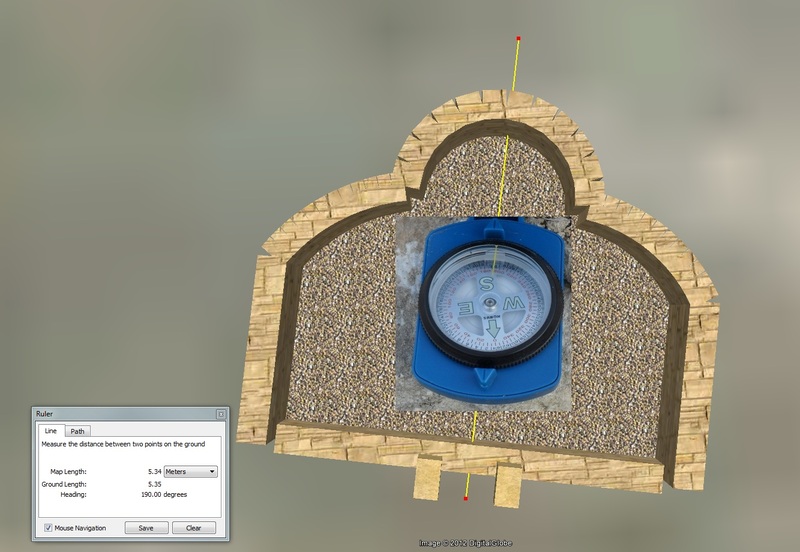 We have suggested that it may be a megalithic temple, we have presented some pictures that show a clear resemblance between the Maltese building and the Lampedusa one.. we may well be wrong in our assessment and alternative theories could be proposed, in any case our main purpose here is to stimulate additional studies and research. 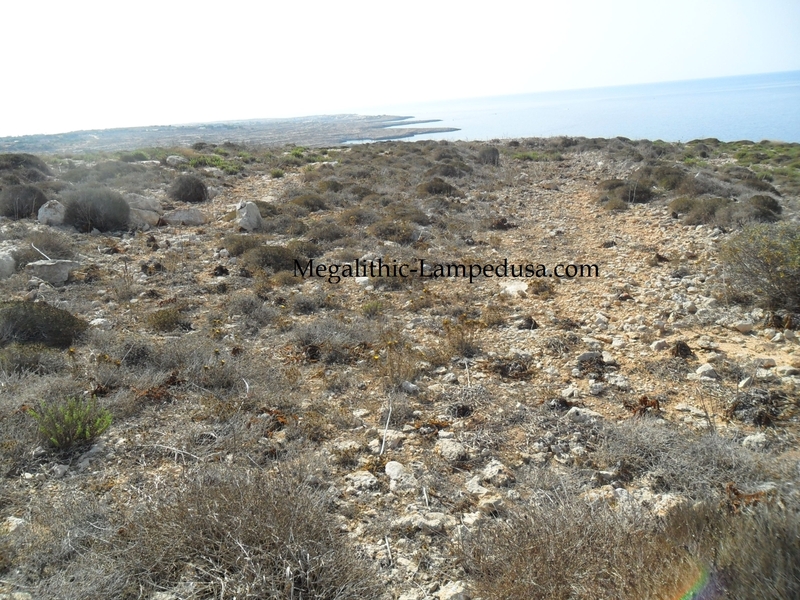 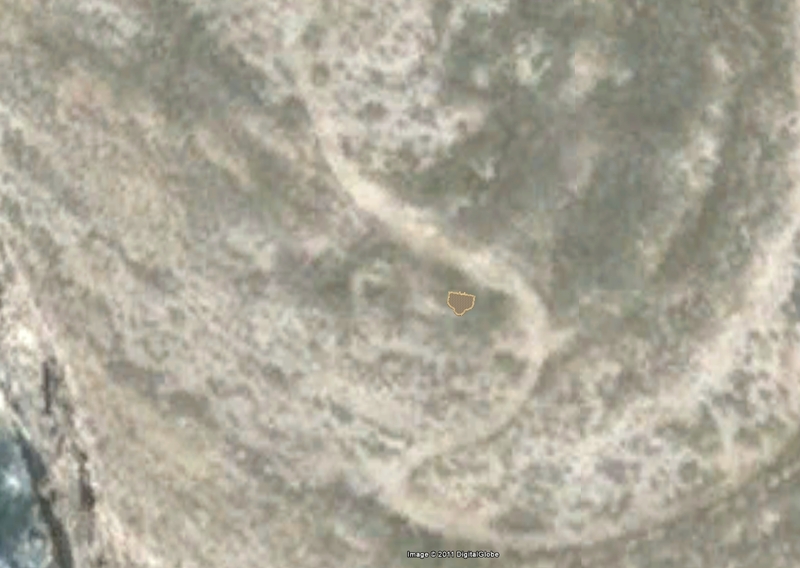 It may be worth to remember that this is not an isolated stone structure: it lays only 600 meters SE of the "Tabaccara megalithic village" and just 300 meters south of one of the three large stone circles of Lampedusa. 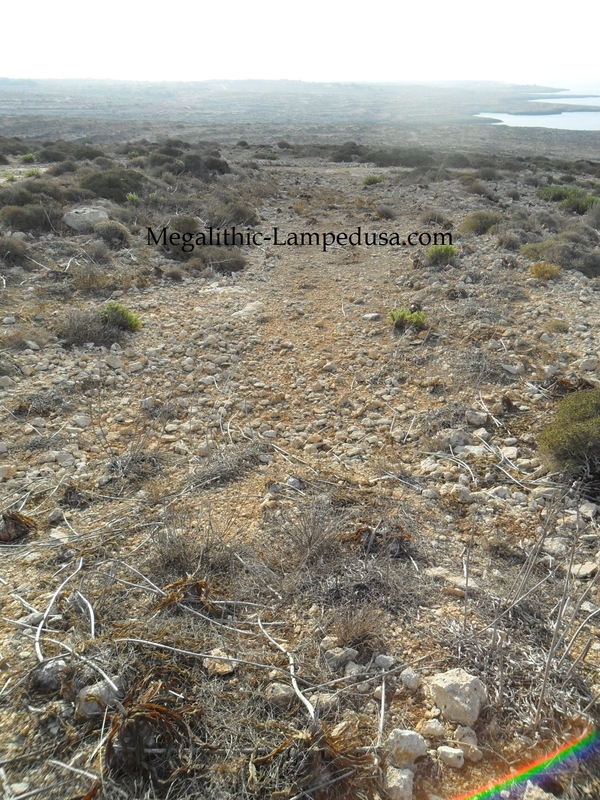 How long before an archaeologist visit the island to study the megalithic remains of Lampedusa? 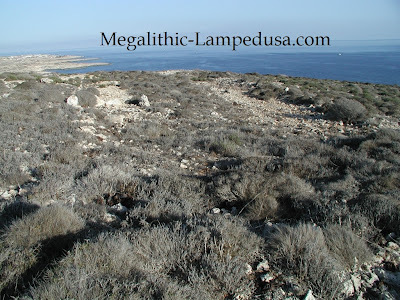 Which was the role of Lampedusa in the Mediterranean trade? Which were its links with the nearby Malta? All these questions deserve further study and research and may help to improve our knowledge of the Mediterranean Prehistory. The remains that we have described above are not protected: we invite all the visitors to respect them and to observe them with the utmost care in order to avoid damaging them . Any finding should reported to the competent authorities. 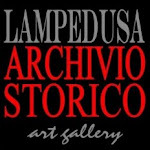 3 “Le Strutture curvilinee di Lampedusa: proposta di interpretazione” Armida De Miro, in Quaderni dell’ Istituto Archeologia, Università di Messina, n. 9 , year 1994. 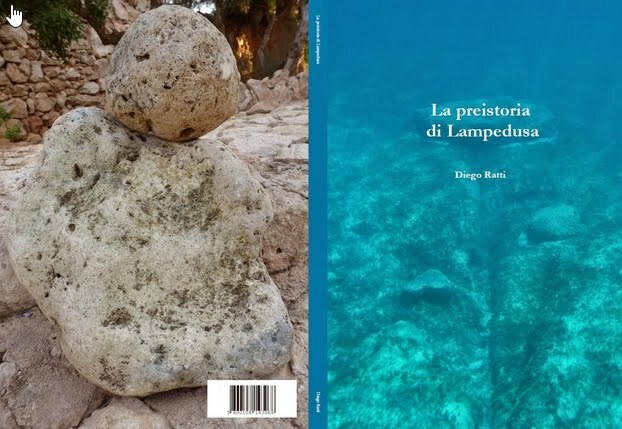 “Tracce di un insediamento neolitico nell’ isola di Lampedusa” G. Radi, 1973 in Atti della Società Toscana di Scienze Naturali- Serie A - pp 197-205 Istituto Archeologia, Università di Messina, n. 9 , year 1994.